Summary (from the back of the book): Marion and Shiva Stone are twin brothers born of a secret union between a beautiful Indian nun and a brash British surgeon. Orphaned by their mother's death and their father's disappearance, bound together by a preternatural connection and a shared fascination with medicine, the twins come of age as Ethiopia hovers on the brink of revolution. 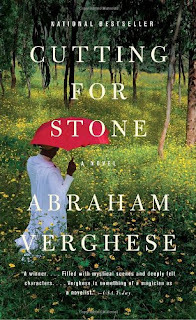 Moving from Addis Ababa to New York City and back again, Cutting for Stone is an unforgettable story of love and betrayal, medicine and ordinary miracles--and two brothers whose fates are forever intertwined. Review: 658 pages of story is a lot for me. Especially when so much of the first 300 pages or so felt like too much information. Then I hit my stride with the book and it all started to come together. The last 100 pages were my favorite parts and are the reason this book gets the 4.5 out of 5. There is so much going on in this story and now that I have finished the book I see why we need to know so much about each of the characters, their personalities, and where they came from... it's all relevant in the end. However, I do think he could have condensed it a bit. I liked the characters a lot, especially Hema and Ghosh, the couple that takes over guardianship of the twins from the day they are born. They are caring, competent, thoughtful, and wise. To have people like that to guide one through life would be a privilege. The twins are also very interesting: at once the same and so very different in their talents. Their father, Thomas Stone, is absent for much of the book, but when he makes an appearance in the last quarter of the story he is so important, simply because of who he was, is and who he becomes. I feel like this review is vague, but I really don't to give anything about the story away! I also liked that I learned about Ethiopian food, culture and history while reading this book. The best part was that the history didn't drone on, but revealed itself as necessary to the storyline. What is really interesting is the mixture of religions in this book: Coptic, Catholic, Hindu, and more all blend together to encircle the characters and their actions. I liked how they all got mixed up together and one religion would come out more strongly depending on the character and the situation. 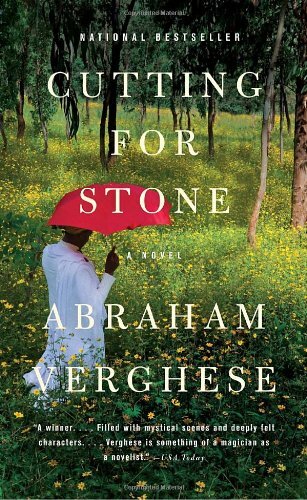 I have never read a book set in Ethiopia before and as I read it I kept picturing these Ethiopian sisters who used to attend the school where I teach. They were so beautiful that everyone in this book had the same beautiful look in my mind. Click to see my updated Google Map. What a great review, Helen. I loved this book as well. It is hard to capture, though, isn't it? There's just so much going on! I don't know if I'd slog through 300 pages of information to get to the plot of a book, but I'm glad you chugged through and this one ended up such a hit for you! Connolly-Ahern--You're so right, this one is difficult to explain since there is SO much going on! I loved experiencing this book again through your review. Glad u liked it. Diane--I am so glad that I stuck it out to the end of the book. I really wasn't sure in the first couple hundred pages. Great review! I'm glad you loved the book. I didn't realize it was 650-odd pages. That is a huge book! I'll add it to my pile too!